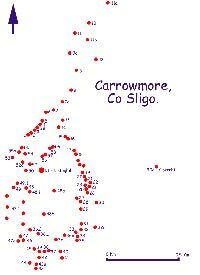 Circle 3 at Carrowmore. Charcoal from this monument produced a set of contraversial radiocarbon dates stretching back to 5,400 BC, but these have since been ajusted back to about 3,800 BC. This small and relatively harmless looking monument has turned out to be one of the more contraversial sites in Carrowmore. The circle is directly across the road from the visitor centre. There are 30 boulders arranged in a circle which measures 13 meters in diameter. Four boulders have disappeared since Petrie's time. There are two smaller inner circles, measuring 9.7 and 7.5 meters in diameter. The monument was dug by Roger Walker, who "found an internment".The circle was measured and described by Petrie in 1837. The circle was excavated by Wood-Martin around 1880, and his report, taken from Borlase's Dolmens of Ireland, is given below. The chamber and passage are oriented to the south, to Listoghil at the centre of the complex. The passage, the symbolic link between the land of the living and the world of the dead, is just over 2 meters long. The chamber has a flagged floor and is roofed by a disturbed gneiss slab. The chamber is much too small for a living person to fit into. The Swedish archaeological team excavated Site 3 in 1978. The picture (below) is a photomontage taken during the dig. These montages were taken by setting up a tall tripod on the site. A camera was slid up one of the legs and the process of the excavation assembled into montages. I find them to be very attractive images, but the technique never took off in Ireland. Photo-montage of Carrowmore 4 during excavations by the Swedish team. Between Wood-Martin and Burenhult, 32kg of cremated bone came from this small monument. Many fragments of bone and antler pins were found, which suggests that they were a primary part of the burial ritual. Stone beads, a piece of flint and chert were also found. The carbon dates from this dig published by Burenhult were extremely early: 5400 and 4600 cal BC respectively from charcoal in foundation sockets in cist c. 4100 and 4000 cal BC. Charcoal from stone sockets c. 3800 cal BC charcoal from stone socket of passage c.3000 cal BC: charcoal from secondary inner stone circle. Five dates between 3300 and 2500 cal BC. However, a more recent dating programme using red deer antler was undertaken by Bergh and Hensey in 2013, and demonstrated that the oldest use of Carrowmore was around 3,800 BC. 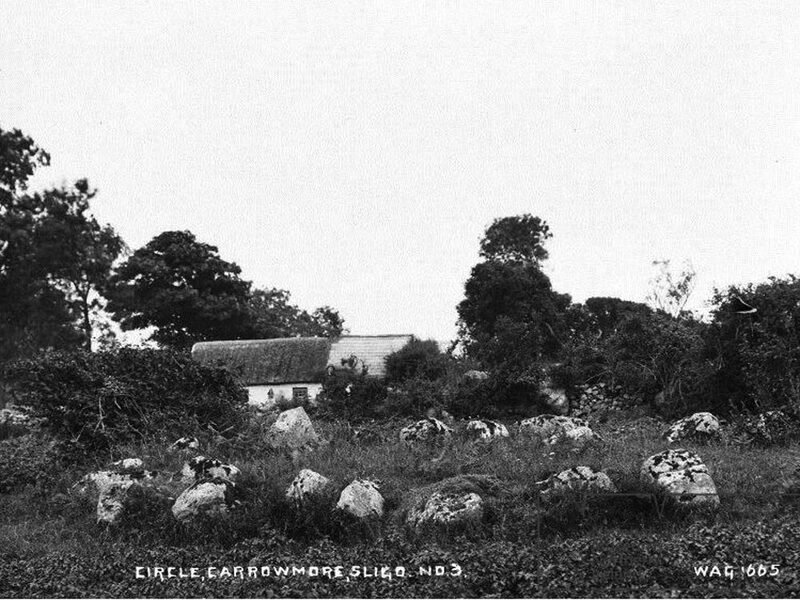 Early photograph of Circle 3 by R. Welsh. No. 3 (I) (dolmen-circle, a few paces E. of II). "This circle is 40 feet in diameter, and consists of 34 stones, of which 4 have been displaced. The cromleac remains, but the upper stone has been thrown off its supporters. It is only 4 feet long, 1.5 feet thick, and 12 feet in circumference. Mr. Walker had the chamber of this cromleac searched, and found an interment within it. 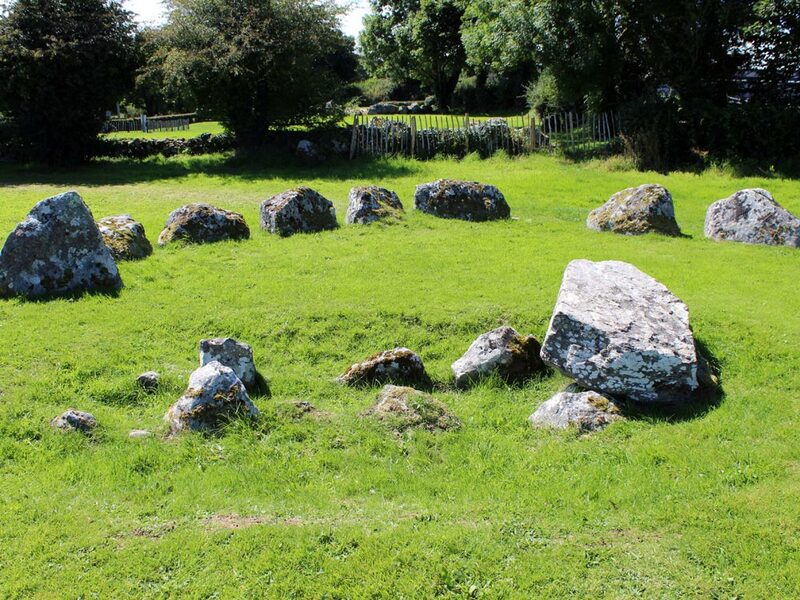 This circle appears to have had an outer one of very large stones, 12 in number, but only 6 of them now remain." - Petrie. 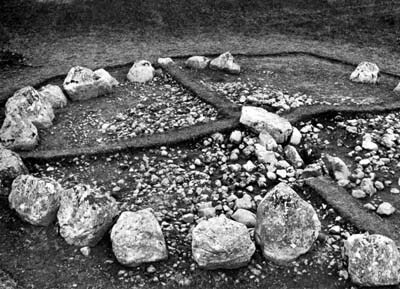 "The cist in this circle is of the figure-of-eight pattern" [that is to say, it is a double one], having a longer axis S. S. E. and N. N. W. The circle round it measures 42 feet in diameter. "One flag, evidently a covering-stone, remains; but it is partially sunk into the chamber, the side-stones of which average about 3 feet 6 ins. in depth." An excavation was made, and was "carried down to the flagged floor of the cist, traces of which were apparent." "Abundant calcined and uncalcined remains were brought to light, as well as three stone-beads, and a pendant formed of a natural quartz prism, clear as glass, through the amorphous end of which a hole had been pierced for suspension. This hole was, on both sides, considerably wider externally than in the centre, showing that it had been bored with rude appliances...... It appeared to have been submitted to intense heat, for, on lifting it, part of the extremity of the prism flaked off when touched." - Wood-Martin. Chamber of Circle 3 at Carrowmore. Besides this amulet of quartz, there was found in this cist "a stone bead formed of steatite, somewhat round in form, of a whitish colour, and highly calcined, and a second bead, also formed of steatite, and highly calcined, but smaller and more elongated in shape, having the diameter of the perforation equal throughout, which is not the case in the rounder bead, where the orifices are larger than the central portion of the hole. Bluish stains in these beads result from the presence of phosphate of iron from the calcined bones. A third bead resembling the first is formed of a stone of a yellowish-brown colour. It is pierced with a hole, in which the marks left by the rotatory motion of the implement, with which it was pierced, are distinctly visible. It did not seem to have been affected by intense heat, as the others had. The material was steatite."--Wood-Martin. In shape this bead resembles precisely one found by me in a tumulus at Ballowal in West Cornwall. The form, too, of the quartz pendant is similar to that of a stone pendant, found also by me, together with blue barrel-shaped vitreous beads, in a cairn at Boscregan in the same district. In the latter cairn, together with the beads and pendant, was a little button with two perforations joining in the centre, formed of steatite (see "Archaeologia," vol. xlix. p. 189). Carrowmore 4 during excavations by the Swedish team. "Steatite is found at Crohey Head in Donegal, and also in Antrim. In addition to the beads, several fragments of bone pins were found in this cist. One of them - the upper portion, which exhibits a head carved into a mushroom shape - is in a petrified state. Another fragment is perhaps the curved point of the same pin. Another piece is curved and polished, and a fourth is the tapering portion of a straight implement. There was also a completely petrified portion of bone like a spear-head, artificially dressed at the point, possibly used as a whetstone."--Wood-Martin. "This tomb was the richest in relics of the entire series. The uncalcined remains, considered to be human, included a metatarsal bone of the left foot, a portion of a cervical vertebra, a piece of a radius (fore-arm bone), a piece of a dorsal vertebra. There were also uncalcined bones of animals, birds, and fish (gurnard). The calcined remains consisted of about 28lbs. of small fragments of bones, so saturated with lime salts that many were completely petrified. Numerous pieces were charred, and coloured bluish grey or black from the action of fire. There were many fragments presenting crack-like marks, but none distinctly human. There were also (a) fragments of bones not human, mostly small portions of the skulls of pigs; (b) nine pieces of petrified bone, and one charred lump; (c) a smooth, flattish, circular stone, very dark in colour, similar to, but smaller than one found in No. 4 monument (see infra). This stone weighed 1 oz. 3 drms. 50 grs. It was 5/8 of an inch long, 1 9/16 of an inch broad, and 0.5 inch thick." A similar disc was found with an urn at Rathbarran. With the form of the double cist in this monument we may compare such structures as those of Arnasbrack, Carrownagh, etc. It appears to me not improbable that a line of cists, of which these two are the inner ones, terminated at the south-southeast, in the ring surrounding this cairn. View of Circle 3 looking north.